Uganda was represented by Dr Mark Henry Rubarenzya of Uganda National Roads Authority and Dr Joel Webster Mbujje of Ndejje University. 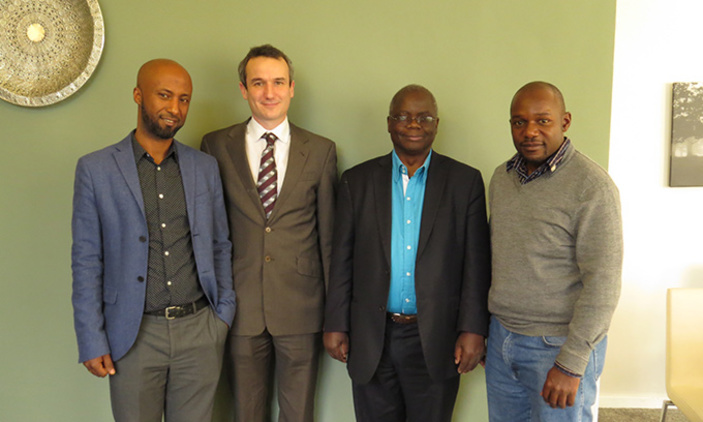 From left to right, Dr Bikila Wodajo, Dr Francis Pope – University of Birmingham, Professor Michael Gatari and Dr Mark Henry Rubarenzya. An alliance of African and British experts this week gathered at the University of Birmingham to understand how to save lives at risk from air pollution – one of the biggest killers in urban Africa. Led by the University of Birmingham, the three-day conference was part of a major international research project looking at how rapid urbanisation in three African cities - Addis Ababa, Kampala and Nairobi impacts upon air quality. ‘A Systems Approach to Air Pollution in East Africa’ (ASAP East Africa) brings together leading UK and East African researchers in air pollution, urban planning, economic geography, public health, social sciences and development studies to provide a framework for improved air quality management in East African cities. Rubarenzya is an interdisciplinary professional with very strong skills in water resources; a strong understanding of the related technical, socioeconomic, policy and environmental issues in Africa, Australia and Europe. He hold a PhD is in civil engineering from Katholieke Universiteit in Belgium and 12 years’ experience as a consultant, public servant and researcher. Mbujje holds a PhD in Structural Engineering from Huazhong University in China. His interested in optimisation of materials for transport infrastructure. Funded by the UK Department for International Development (DFID) through the East Africa Research Fund, the study aims to develop new ways of monitoring air pollution to gather evidence on the causes, consequences and levels of air pollution in African cities. Air pollution presents a global problem - causing an estimated 5.5 million premature deaths worldwide - one in every ten total deaths. Given the lack of air quality data in low and middle income countries, local governments often struggle to understand how air pollution impacts on urban residents or factor air pollution concerns into urban planning. This challenge is particularly pressing in East African cities where population growth between 2015 and 2030 is expected to be substantial; for example, Addis Ababa’s population is projected to increase by 80%, Kampala’s 103% and Nairobi’s 82%.